Things I liked: Fit and finished product, works as designed. It keeps my scope (Hawke 8-32X50 SR" zeroed within 30 yards even after taking it off, just be sure to mount it back in the exact same position. Things I would have changed: Nothing - works perfectly. What others should know: They provide a tool for the amount of compression for the clamp to your weaver rail - it's best to use this and keep the pressure snug but not overly tight. Things I liked: Well-made, rock-solid. I was surprised at the high quality for the low price. I've paid more for tactical mounts and gotten no more quality. Makes me think! What others should know: The claws/clamps are adjustable. Throw the lever on the clamp. Not tight enough because the rail is not mil-spec? No problem, just use the allen key to tighten. Brilliant. I have this on my semi-auto .22LR, so it won't be subject to high recoil, but it will experience some vibration. I anticipate no problems. Things I liked: Quality, height, lever lock, easy to use. 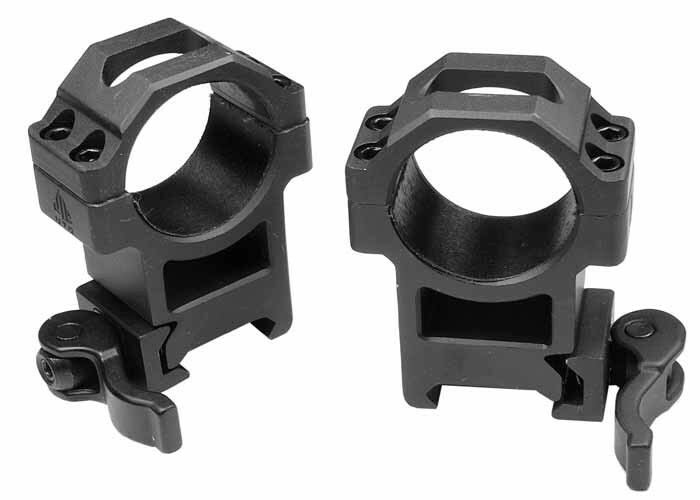 What others should know: These are perfect for a Leapers UTG Scope mounted on a Hatsan Vectis. They allow the use of the magazine without interfering with the scope. Things I liked: Easy to use and set up. What others should know: I use them to move the premium scope from my Bulldog to Prod, although those two rails are slightly different in demensions, a quarter turn on the adjustment screw makes the nice and secure. I will buy more for my other scopes, they are agteat value for the price. Things I liked: For easy removal of a scope for easier transport makes these rings a must. Things I would have changed: There isn't anything that I would change about these rings. Things I liked: If you are putting a expensive scope on your air gun? There no better rings than these! They just make good sense for the investment you've already made in the scope! What others should know: You'll love the quick release feature! Things I would have changed: I would like to have pic caps and not have to order separately to mount a light. What others should know: These also work great to mount a streamlight stinger, wow you talk about being able to see, with or with out a red filter.